The popliteal artery is the direct continuation of the superficial femoral artery in the popliteal fossa as the vessel courses posteriorly behind the knee. It gives the main branch as the anterior tibial artery and continues as the tibioperoneal or tibiofibular trunk or posterior tibial artery. It supplies knee, lower leg and foot. Femoral artery, a continuation of the external iliac artery is the main artery of the lower limb. In thigh, it travels through adductor canal and comes out of the adductor canal through adductor hiatus, an opening in the adductor magnus, at the junction of the middle and lower thirds of the thigh. It is anterior to bone in the femoral canal and as it travels below becomes anteromedial first and then medial at adductor hiatus and then travels posterior to the bone. After it comes out of adductor hiatus, it is called popliteal artery. It travels downward and lateralward to the intercondylar fossa of the femur. The popliteal artery is the deepest or anteriormost structure in the popliteal fossa and the artery runs in close proximity to the joint capsule of the knee as it spans the intercondylar fossa. In its course, it gives off branches some of which participate in the formation of the periarticular genicular anastomosis, a network of vessels surrounding the knee that provides collateral circulation. In the lower part of the popliteal fossa, it is sandwiched between the gastrocnemius and popliteus muscles. It travels vertically downward to the lower border of the popliteus muscle, where it divides into anterior and posterior tibial arteries. The anterior tibial artery, passes anteriorly between the tibia and fibula, through a gap in the interosseous membrane. It then moves inferiorly down the leg. The posterior tibial artery [ proximal to the fibular artery origin, it is sometimes called the tibial-peroneal trunk or tibial-fibular trunk] and continues further posteriorly and supplies the posterior compartment of the leg. The artery sometimes divides into the anterior tibial and peroneal, the posterior tibial being wanting, or very small. Occasionally it divides into three branches, the anterior and posterior tibial, and peroneal. Below- Plantaris and the lateral head of the gastrocnemius. Below, the tibial nerve, the popliteal vein, and the medial head of the gastrocnemius. The superior muscular branches, two or three in number, arise from the upper part of the artery and are distributed to the lower parts of the adductor magnus and hamstring muscles, anastomosing with the terminal part of the profunda femoris, a branch of the femoral artery. Also called inferior muscular arteries, these are two large branches, which arise opposite the knee joint and supply to the gastrocnemius, soleus, and plantaris. Superior genicular arteries, two in number, arise one on either side of the popliteal, and wind around the femur immediately above its condyles to the front of the knee joint. One of the branches of medial superior genicular artery supplies vastus medialis also. Middle genicular artery is a small branch, arising opposite the back of the knee joint. It pierces the oblique popliteal ligament and supplies the ligaments and synovial membrane in the interior of the articulation. The inferior genicular arteries (two in number, arise from the popliteal beneath the Gastrocnemius. Genicular arteries, apart from supplying structures around the knee, create anastomosis around the knee called circumpatellar anastomosis. 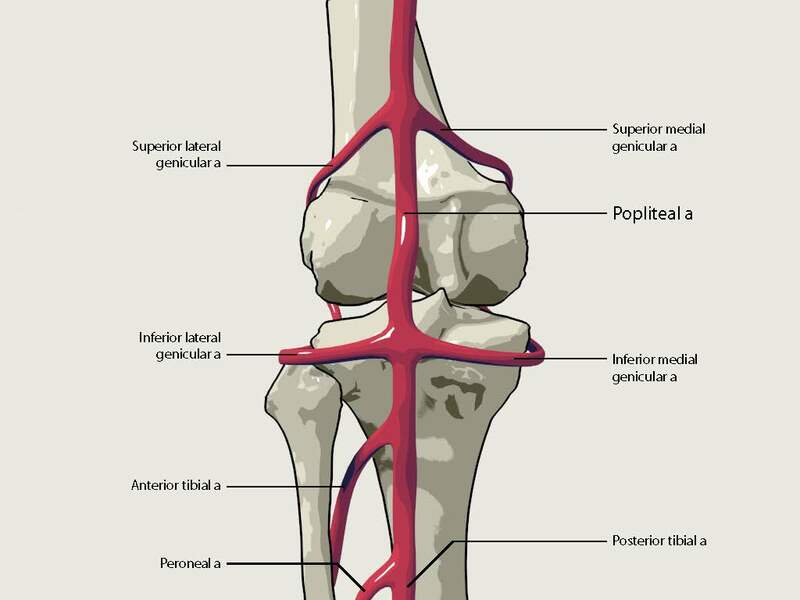 The popliteal artery may divide into its terminal branches above the level of the popliteus. The anterior tibial artery then descends deep (anterior) to the popliteus. It may divide into the anterior tibial and the peroneal arteries, and the posterior tibial may be completely absent or rudimentary. It may divide into three branches, the anterior and posterior tibial arteries, and the peroneal artery.